The majority of people alive today will not remember The Blitz first hand, however, the events that took place back then dramatically altered the lives of many families – and it continues to have an impact on future generations as the years pass by. We may have heard stories about The Blitz and how it affected people who lived in London at the time, how many younger children were evacuated for their own safety to other parts of the country and the widespread use of bomb shelters – but how did The Blitz start, and why? The term “Blitz” is derived from the German word for lightning – it was used to describe the prolonged strategic bombing of Britain by Nazi Germany in World War 2. 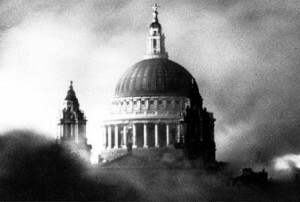 Between 7 September 1940 and 10 May 1941 sustained attacks were made on the capital – for 76 consecutive nights the Luftwaffe bombed London, followed by attacks on other cities across the country. The effect that The Blitz had was catastrophic; over 40,000 civilians were killed – with more than half of this number in London. Additionally, over one million London homes were destroyed or badly damaged. The devastation also spread outside of London, with many ports and industrial centres across the country coming under attack. Liverpool was the most heavily bombed city aside from London, with events leading to approximately 4,000 casualties. Ports in Bristol, Cardiff, Kingston upon Hull, Plymouth and Southampton were also targeted and industrial cities such as Manchester, Glasgow, Birmingham, Belfast and Coventry also suffered from extensive attacks. During this bleak period in World War 2, every town and city in the UK had the potential to be a target. Although the major industrial cities suffered the most damage from bombings, in particular munitions factories were targeted in a bid by the Nazis to disable factories that produced army supplies, many innocent lives were also lost during The Blitz of World War 2. As technology was somewhat primitive in comparison to today, on many occasions very little warning could be given to people in a targeted area. To this end, the majority of homes had a bomb shelter/basement – or a shelter located close by underground, providing a safe haven during bomb strikes. On hearing a warning siren, people would rush to the nearest shelter to take refuge. It’s difficult to imagine the terror that the people in the bomb shelters must have felt – unsure as to how safe they were and whether or not their homes would still be standing when they emerged back onto the streets. However, many people now view The Blitz as a great triumph for the British people during the horrific events of World War 2. For sure, the bombing did not achieve its intended results, the British did not surrender and war economy withheld the sustained attacks. In fact, throughout the events of The Blitz, British production and the war industries operated as normal – and even continued to expand. There’s no doubt that The Blitz had a terrible impact on the UK, however, to this day, it continues to be an example of British pride and endurance at it’s very best.